Is BYOD Stealing the Big Data Limelight? If you had to name some of the biggest trending terms in the tech space today, big data would certainly come to mind. However, since big data is something many businesses are unfamiliar with and are approaching cautiously as they learn more about it and its various solutions, such as Big data as a Service, BYOD is drawing many businesses’ attention. If you had to name some of the biggest trending terms in the tech space today, big data would certainly come to mind. However, since big data is something many businesses are unfamiliar with and are approaching cautiously as they learn more about it and its various solutions, such as Big data as a Service, BYOD is drawing many businesses’ attention. BYOD is less of a technological innovation and more of a necessary response to a growing trend. With such a large percentage of the population owning some kind of mobile device, be it a laptop, tablet or smartphone, employers are increasingly dealing with employees who bring their device to work and use it to access work-related data. In fact, a recent study found that 86 percent of workers will use their smartphone to do work, including outside of business hours. In addition, 50 percent of those polled said they would use their personal phone over a desk phone even if one was made available. While this trend has prompted some businesses to ban outside devices at the office, other employers have embraced the trend and so far in greater amounts than those pursuing big data or cloud computing. A study completed by IBM of major IT decision makers found that 57 percent of those surveyed were planning on investing in BYOD, but 47 percent were interested in big data or cloud computing. While these numbers in no way indicate big data isn’t capturing company’s interest, they do show that companies are acting more quickly on BYOD, due at least in part to the increasing demand by employees. 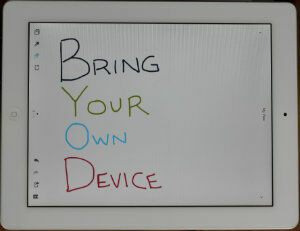 What are some of the advantages of embracing BYOD? As workers, especially younger workers, become more and more accustomed to the mobility and ease of using their own devices, those businesses that don’t permit personal devices risk losing those employees to those companies that do. On the other hand, being allowed to use a preferred device can increase job satisfaction, and workers have started to evaluate job opportunities based on BYOD policies. BYOD policies have been found to increase worker productivity as well. According to a Cisco Study, employees will get an extra 37 minutes of work done a week if they are on their own device. In addition, employees who can still login despite snow storms or natural disasters can prevent a big loss in profits due to downtime. Even if the other benefits aren’t appealing, some businesses are adopting BYOD policies simply because they need to take control over the data that is stored or accessed via their employees devices because employees are already using them. A lost smartphone or laptop can be a big liability for a company, so educating employees and putting security measures in place is the best way to protect the business. Of course, allowing employees to use personal devices at work brings with it a need for BYOD solutions that solve security and other legal concerns. Apart from the obvious problems of controlling who has access to what and lost laptops, it also raises the concern of employees being forced to work off the clock because they can always be reached. In addition, collecting business data from a personal device when an employee leaves a company is another issue businesses have to address. Despite the concerns, BYOD is a trend that isn’t going away, and those companies that are proactive in addressing it will be better off in the long run. Which trend do you see growing more quickly, BYOD or big data?